The Union of Concerned Scientists updated their EV greenhouse gas emissions data, based on eGRID 2016 data, GREET 2017 data, and 2017 EV sales. Having equivalent well-to-wheels greenhouse gas emissions to a gasoline vehicle getting 80 MPG (or about 2.9 l/100 km) is... honestly really good, especially considering the inefficiency of some of the vehicles included in their data. 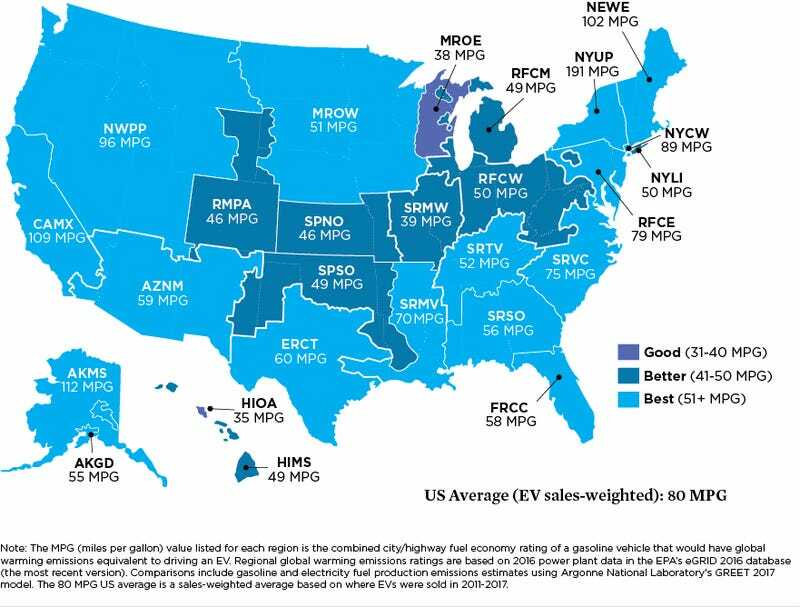 Basically, compared to the most fuel efficient vehicle on gasoline on the EPA tests, the Hyundai Ioniq Blue, there’s only four regions in the country where the EV has higher GHG emissions - HIOA (O‘ahu), MROE (much of Wisconsin, as well as much of Michigan’s Upper Peninsula), SRMW (much of Illinois and Missouri), and SRSO (Georgia, much of Alabama, part of Mississippi and the Florida Panhandle).